J.-P. Allouche and M. Mendès France. In F. Axel and D. Gratias, editors, Beyond Quasicrystals, pages 293-367. Les Éditions de Physique/Springer, 1995. J.-P. Allouche, A. Arnold, J. Berstel, S. Brlek, W. Jockush, S. Plouffe, and B. E. Sagan. Discrete Math. 139 (1995), 455-461. J.-P. Allouche and T. Johnson. Finite automata and morphisms in assisted musical composition. Journal of New Music Research 24 (1995), 97-108. J.-P. Allouche and M. Bousquet-Mélou. On the conjectures of Rauzy and Shallit for infinite words. Commentationes Math. Univ. Carolinae 36 (1995), 705-711. Narayana's cows and delayed morphisms. In 3èmes Journées d'Informatique Musicale (JIM '96), Ile de Tatihou, pages 2-7, May 1996. J.-P. Allouche, F. von Haeseler, H.-O. Peitgen, and G. Skordev. Linear cellular automata, finite automata and Pascal's triangle. Discrete Appl. Math. 66 (1996), 1-22. J.-P. Allouche, A. Lubiw, M. Mendès France, A. van der Poorten, and J. Shallit. Convergents of folded continued fractions. Acta Arithmetica 77 (1996), 77-96. Transcendence of the Carlitz-Goss Gamma function at rational arguments. J. Number Theory 60 (1996), 318-328. Note on the constructible sets of a topological space. pages 1-10. Annals of the New-York Academy of Science, 1996. J.-P. Allouche and V. Berthé. Triangle de Pascal, complexité et automates. Bull. Belg. Math. Soc. 4 (1997), 1-23. J.-P. Allouche, E. Cateland, W.-J. Gilbert, H.-O. Peitgen, J. Shallit, and G. Skordev. Automatic maps on a semiring with digits. Theory Comput. Syst. (Math. Systems Theory) 30 (1997), 285-331. Schrödinger operators with Rudin-Shapiro potentials are not palindromic. J. Math. Phys., Special Issue ``Quantum Problems in Condensed Matter Physics'' 38 (1997), 1843-1848. A remark on Apéry's numbers. J. Comput. Appl. Math. 83 (1997), 123-125. J.-P. Allouche, F. von Haeseler, H.-O. Peitgen, A. Petersen, and G. Skordev. 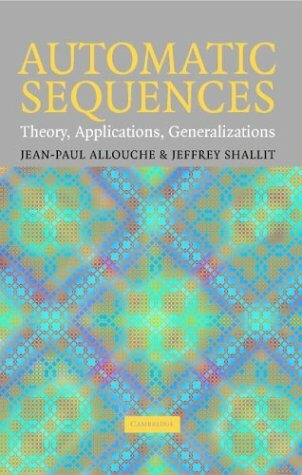 Automaticity of double sequences generated by one-dimensional linear cellular automata. Theoret. Comput. Sci. 186 (1997), 195-209. Note on the transcendence of a generating function. the 75th birthday of Prof. Kubilius, New trends in Probab. and Statist., Vol. 4, pages 461-465. 1997. J.-P. Allouche and L. Q. Zamboni. Algebraic irrational binary numbers cannot be fixed points of non-trivial constant length or primitive morphisms. J. Number Theory 69 (1998), 119-124. J.-P. Allouche, J. Peyrière, Z. X. Wen, and Z. Y. Wen. Hankel determinants of the Thue-Morse sequence. Annales de l'Institut Fourier 48 (1998), 1-27. J.-P. Allouche, J. Currie, and J. Shallit. Extremal infinite overlap-free binary words. Electronic J. Combinatorics 5 (1) (1998). B. Leblanc, E. Lutton, and J.-P. Allouche. Inverse problems for finite automata: a solution based on genetic algorithms. Lecture Notes in Computer Science 1363 (1998), pp. 157-166. J.-P. Allouche and J. Shallit. European Journal of Combinatorics 19 (1998), 401-411. J.-P. Allouche, D. Gouyou-Beauchamps, and G. Skordev. Transcendence of binomial and Lucas' formal power series. J. Algebra 210 (1998), 577-592. J.-P. Allouche and D. Thakur. Automata and transcendence of Tate period in finite characteristic. Proc. Amer. Math. Soc. 127 (1999), 1309-1312. Transcendence of formal power series with rational coefficients. Theoret. Comput. Sci. 218 (1999), 143-160.
their applications, Proceedings of SETA'98, pages 1-16. Spinger-Verlag, 1999. Sums of digits, overlaps, and palindromes. Discrete Math. & Theoret. Comput. Sci. 4 (2000), 1-10. J.-P. Allouche and G. Skordev. Schur congruences, Carlitz sequences of polynomials and automaticity. Discrete Math. 214 (2000), 21-49. J.-P. Allouche and M. Cosnard. The Komornik-Loreti constant is transcendental. Amer. Math. Monthly 107 (2000), 447-448. J.-P. Allouche, J. Peyrière, and M. Mendès France. J. Number Theory 81 (2000), 359-373. Nouveaux résultats de transcendance de réels à développement non aléatoire. Gazette des Mathématiciens 84 (2000), 19-34. J.-P. Allouche, K. Scheicher, and R. F. Tichy. Regular maps in generalized number systems. Math. Slovaca 50 (2000), 41-58.
in M. Planat editor, Noise, Oscillators and algebraic randomness, Lecture Notes in Physics, (2000), 345-356. Non-integer bases, iteration of continuous real maps, and an arithmetic self-similar set. Acta Math. Hungar. 91 (2001), 325-332. J.-P. Allouche, J.-M. Deshouillers, T. Kamae, and T. Koyanagi. Automata, algebraicity and distribution of sequences of powers. Ann. Inst. Fourier 51 (2001), 687-705. J.-P. Allouche, M. Courbage, and G. Skordev. Cubo, Matemática Educacional 3 (2001), 213-244. J.-P. Allouche, J. L. Davison, M. Queffélec, and L. Q. Zamboni. Transcendence of Sturmian or morphic continued fractions. J. Number Theory 91 (2001), 39-66. J.-P. Allouche, M. Baake, J. Cassaigne, D. Damanik. Theoret. Comput. Sci. 292 (2003), 9-31. Remarks on permutive cellular automata. J. Comput. Sci. Syst. 67 (2003), 174-182. Cambridge University Press, 2003, 571 + xvi pages. The ring of k-regular sequences, II. Theoret. Comput. Sci. Syst. 307 (2003), 3-29. J.-P. Allouche, N. Rampersad, J. Shallit. On integer sequences whose first iterates are linear. Aequ. Math. 69 (2005), 114-127. J.-P. Allouche, J. Shallit, G. Skordev. Self-generating sets, integers with missing blocks, and substitutions. Dicrete Math. 292 (2005), 1-15. J. Théorie des Nombres Bordeaux 17 (2005), 1-11. Restricted towers of Hanoi and morphisms. Lect. Notes Comp. Sci. 3572 (2005), 1-10. Some applications of combinatorics on words in number theory. 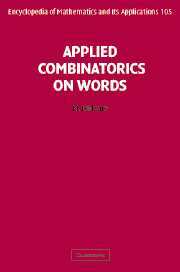 In Applied Combinatorics on Words, M. Lothaire. Cambridge University Press, 2005, pp. 520-578. G. Allouche, J.-P. Allouche, J. Shallit. Kolam indiens, dessins sur le sable aux îles Vanuatu, courbe de Sierpinski et morphismes de monoïde. Ann. Inst. Fourier 56 (2006), 2115-2130. J.-P. Allouche, J. Shallit, J. Sondow. Summation of series defined by counting blocks of digits. J. Number Theory 123 (2007), 133-143. Note on an integral of Ramanujan. Ramanujan J. 14 (2007), 39-42. J.-P. Allouche, C. Frougny, K. Hare. Math. Comp. 76 (2007), 1639-1660. Reversals and palindromes in continued fractions. Theoret. Comput. Sci. 380 (2007), 220-237. Von Koch and Thue-Morse revisited. Infinite products with strongly B-multiplicative exponents. Annales Univ. Sci. Budapest., Sect. Comp. 28 (2008), 35-53. A note on univoque self-Sturmian numbers. RAIRO, Informatique Théorique et Applications 42 (2008), 659-662. J.-P. Allouche, M. Mendès France. Euler, Pisot, Prouhet-Thue-Morse, Wallis and the duplication of sines. Monatshefte für Mathematik 155 (2008) 301-315. Univoque numbers and an avatar of Thue-Morse. Acta Arithmetica 136 (2009) 319-329. Theoretical Computer Science 410 (2009) 2795-2803. J.-P. Allouche, M. Clarke, N. Sidorov. Periodic unique beta-expansions: the Sharkovskiĭ ordering. Ergodic Th. Dyn. Syst. 29 (2009) 1055-1074. Distribution modulo 1 and the lexicographic world. Annales Sc. Math. Québec 33 (2009) 125-143. Univoque numbers and automatic sequences. Éd. J. Barral, S. Seuret, Series: Applied and Numerical Harmonic Analysis. Extremal properties of (epi)Sturmian sequences and distribution modulo 1. L'Ens. Math. 56 (2010) 365-401. Inconstancy of finite and infinite sequences. Theoret. Comput. Sci. 412 (2011) 2268-2281. Hadamard grade of power series. J. Number Theory 131 (2011) 2013-2022. A remark on the Boros-Moll sequence. Surveying some notions of complexity for finite and infinite sequences. in Number Theory and Their Probabilistic Aspects --- Kyoto, 2010 Kôkyûroku Bessatsu Series, B34 (2012) 27-38. On the Stern sequence and its twisted version. A variant of Hofstadter's sequence and finite automata. J. Austr. Math. Soc. 93 (2012) 1-8. Lacunary formal power series and the Stern-Brocot sequence. Acta Arithmetica 159 (2013) 47-61. On a formula of T. Rivoal. Annales Univ. Sci. Budapest., Sect. Comp. 40 (2013) 69-79. Quasicrystals, model sets, and automatic sequences. C. R. Physique 15 (2014) 6-11. Paperfolding infinite products and the gamma function. J. Number Theory 148 (2015) 95-111. Summation of rational series twisted by strongly B-multiplicative coefficients. Electron. J. Combin. 22 (2015) #1.59. A note on products involving zeta(3) and Catalan's constant. Ramanujan J. 37 (2015) 79-88. Didact. Mat. V (2015) 27-32. Thue, Combinatorics on words, and conjectures inspired by the Thue-Morse sequence. J. Théorie des Nombres Bordeaux 27 (2015) 375-388. J.-P. Allouche, B. Cloitre, V. Shevelev. Aequ. Math. 90 (2016) 341-353. Variations on an error sum function for the convergents of some powers of $e$. Unif. Distrib. Theory 11 (2016) 205-210. B. Allombert, J.-P. Allouche, M. Mendès France. Euler's divergent series and an elementary model in Statistical Physics. Ars Math. Contemp. 10 (2017) 67-76. Some extremalities of the binary Fibonacci sequence. Fibonacci Quart. 55, no. 5 (2017) 331-346. Their Applications (C. Ballot, P. G. Anderson, T. Komatsu eds.). Propriétée de Lucas, nombres de Delannoy et séries formelles algébriques. combinatoires en France (1870-1914) et leur actualité. Un hommage à Henri Delannoy. Presses Universitaires de Limoges (2017) 239-254. A generalization of an identity due to Kimura and Ruehr. J.-P. Allouche, M. Mendès France, G. Skordev. Non-intersectivity of paperfolding dragon curves and of curves generated by automatic sequences. J.-P. Allouche, M. Mendès France, G. Tenenbaum. Tokyo J. of Math. 11 (1988) 323-328. Sur la complexité des suites infinies. Bull. Belg. Math. Soc. Simon Stevin 1 (1994) 133-143. J.-P. Allouche, M. Bousquet Mélou. Facteurs des suites de Rudin-Shapiro généralisées. Bull. Belg. Math. Soc. Simon Stevin 1 (1994) 145-164. Canonical positions for the factors in paperfolding sequences. Theoret. Comput. Sci. 129 (1994) 263-278.